Up close, the star looks more like a ruggedly handsome cowboy, at age 76, than he did when he played one in 1969’s Butch Cassidy and the Sundance Kid. Yet Robert Redford still retains his boyish charm, his eyes lit up like a lantern burning on passion. Through the years, Redford has swapped identities for each of his many projects, including the 1974 version of The Great Gatsby, The Way We Were, and The Sting. Do we even know the man behind that iconic face? I sat down with him to fi nd out, following the recent NY premiere of Sony Pictures Classics’ The Company You Keep. It’s easy to defi ne Redford by his accomplishments: the distinguished actor, director, and producer won two Oscars over his illustrious career and countless other awards and honors. Redford’s career began in NYC. Surprisingly, he didn’t come to the Big Apple in pursuit of acting, but instead to study art at the Pratt Institute. One of his teachers recommended that he cash in on his charisma and take classes at the American Academy of Dramatic Arts. “I never imagined being an actor.… I wanted to get a formal education in art so I could go back to Europe and paint,” he says. But he was bit by the acting bug and, by 1959, he was getting bit parts on television series like Perry Mason, Alfred Hitchcock Presents, and The Twilight Zone. Hollywood came knocking after his breakthrough performance in Mike Nichols’ 1963 Broadway production of Barefoot in the Park. Backstage after one of his Barefoot performances, the young actor was given a resonant piece of advice from the legendary Ingrid Bergman: “Do only good work.” Unfortunately, most of Hollywood wanted him to do good-looking work: “The constant reference to me being the way I looked, it made me crazy, like I was being put into a cage.” Fighting against the prettyboy image, Redford turned down roles in iconic fi lms like Who’s Afraid of Virginia Woolf and The Graduate. Although he may have missed out on some great roles, he knew he had to wait for the part that felt right for him. That film established Redford as a Hollywood A-lister, and he soon started to produce his own projects. He got the idea for his fi rst production, All the President’s Men, when he was on a train and overheard some reporters gossiping about a recent break-in at the Watergate complex. When he prodded them for details, the reporters told him that whatever was going on was not going to be divulged to the public. He remembers feeling deeply disappointed in the journalists: “I got so upset by the fact that I didn’t think they were going to do anything.” The power of the press, which he had always held in the highest regard, had failed him. The two were, of course, Bob Woodward and Carl Bernstein. Within the next year, they attracted national attention for their investigation that exposed Nixon’s role in the Watergate scandal. Redford arduously hunted down the journalists. “They refused to meet me at fi rst,” he says. “They thought they were being set up.” Luckily, he earned their trust and the rights to their book. After fi ghting to convince Hollywood studios to green-light the project, he produced and starred in the 1976 classic, which earned four Oscars, four more nominations, and its position on the American Film Institute’s Most Inspiring Movies list. Redford’s own experiences fi ghting the studios to get fi lms made led to his creation of the Sundance Institute, which was created to help fi lmmakers make lower-budget productions outside of the studio system. “It created an opportunity for new fi lmmakers to have a place to go,” says Redford. “And they can keep their individuality. They would not be beholden to studio controls.” Over the years, the Sundance brand has become synonymous with independent fi lm. Not only has the Institute spawned the famed Sundance Film Festival, but it has launched the careers of award-winning fi lmmakers Quentin Tarantino, Morgan Spurlock, and Steven Soderbergh. Most recently, Redford launched Sundance Productions to develop and produce content for television and digital platforms, including the new docu-series Chicagoland, scheduled to premiere on CNN in 2014. 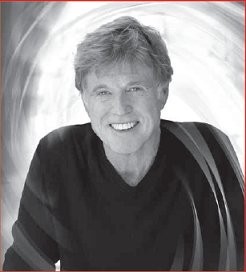 Redford clearly isn’t afraid to embrace change or challenge his own perception of the industry, and his own identity. And there is something bold about a 76-year-old in a superhero franchise, just as there’s something bold about a Hollywood legend living in Utah, or a handsome man obstinately fighting his good looks. Redford continues to zig when you expect him to zag, brazenly bucking America’s expectations. Even after more than half a century in the limelight, it is impossible to predict what Robert Redford will do next.